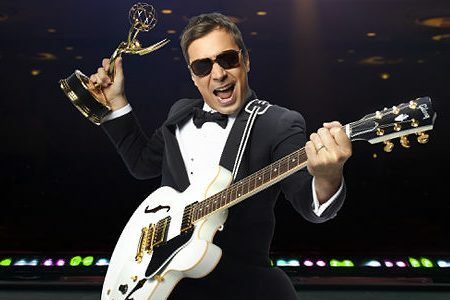 Jimmy Fallon wants you to tweet Emmy intros! The Emmys are moving with the times this year. Not only can fans help draft presenter introductions via Twitter, but they can also go backstage and on the red carpet via a live Ustream feed. Since landing the gig of Primetime Emmy Awards host, Jimmy Fallon has been racking his brain for a way to let fans get their voices heard on the show via Twitter. That idea was a bit over the top, but Fallon and team came up with another good idea that would give fans the opportunity to help write the show! Tweeps can use Twitter to send in ideas for how the Emmys will introduce the night’s presenters, including Ann-Margret, Will Arnett, Stephen Colbert, LL Cool J, Claire Danes, Ted Danson, Emily Deschanel, Edie Falco, Tina Fey, Nathan Fillion, Laurence Fishburne, Ricky Gervais, Lauren Graham, Jon Hamm, Mariska Hargitay, Neil Patrick Harris, January Jones, Boris Kodjoe, John Krasinski, John Lithgow, Eva Longoria-Parker, Gugu Mbatha-Raw, Christopher Meloni, Stephen Moyer, Anna Paquin, Jim Parsons, Jeff Probst, Julianna Margulies, Joel McHale, Matthew Morrison, Matthew Perry, Keri Russell, Tom Selleck, Alexander Skarsgard, Maura Tierney, Blair Underwood, Sofia Vergara and Betty White. Fans submit their ideas by signing into their Twitter account and following the directions at NBC’s I’m On The Emmys page. Then Fallon and his Emmy writing team will incorporate the best tweets into the show. Fans will also have a chance to go behind the scenes by following a live feed at Ustream.com. NBC will set up seven cameras to “eavesdrop” on Emmy nominees, presenters and performers backstage. There’s even a live “thank you” camera, in case any Emmy Award winners have more to say after the music plays them off stage. If that’s not enough access, NBC is also letting fans onto the red carpet to ask their own questions! The carpet action will be streaming live at AccessHollywood.com, Emmys.com and Ustream.com starting at 4 pm Pacific and 7 pm Eastern and fans can suggest questions to correspondent Laura Saltman via Twitter, using the hash tag #emmys10, or submit them via the NBC.com Emmy website. The 62nd Annual Primetime Emmy Awards will be broadcast live coast-to-coast from the Nokia Theatre LA Live in Los Angeles on Sunday, August 29 (5 pm Pacific and 8 pm Eastern) on NBC.